Last year I posted a challenge to everyone to find 5 new people to attend CAST 2011. At the conferences I have attended this year I have told a number of people about CAST and encouraged them to attend. Next week at the conference I am hoping to once again reconnect with a few of these people and see how many stepped up to the challenge! 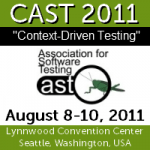 CAST 2011 promises to be another great conference. There are a number of outstanding presentations scheduled which I am excited to be helping facilitate. You can check out the entire CAST schedule here. If you haven’t yet registered for CAST, what are you waiting for? There is still time to be part of this great conference that encourages discussion and interactive, hands-on learning. Register today!